We strive to ensure that every student reaches their full potential by continuously developing our teachers, continuously improving our curriculum and by ensuring students take responsibility for their learning. Students learn best in a safe and welcoming environment, where diversity is valued. Students learn best when they are involved in curriculum design, have a respected voice in decisions about teaching and are actively involved in school governance. The achievement of high academic standards is enabled and underpinned by a curriculum that also develops student well-being, entrepreneurship, problem solving skills, resiliency and creativity. Every student should achieve standards in literacy and numeracy that enable successful employment and further learning. Learning is enhanced by us working closely with families and the wider community. Students should establish goals, be clear about their futures and know how to get there. To continuously improve student learning outcomes, staff must work collaboratively and engage in continuous personal learning. Drafting work, meeting deadlines and continuous improvement goals. 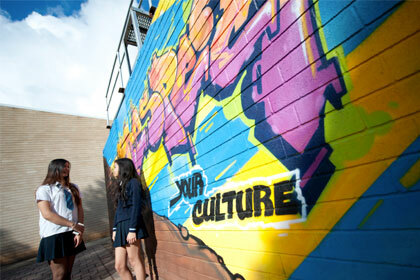 Our students achieve consistently high University and TAFE entrance scores and achieve good employment outcomes. We have a dedicated and highly qualified staff, with low rates of staff turnover. Student and parent feedback suggests a high level of satisfaction with education at Parafield Gardens High School. 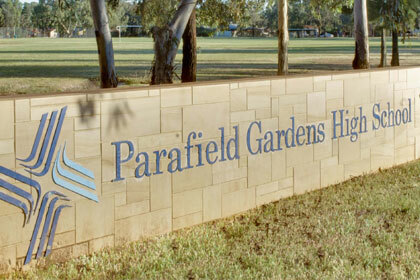 Parafield Gardens High School is located next to excellent public transport, well established housing estates and convenient service and shopping facilities. 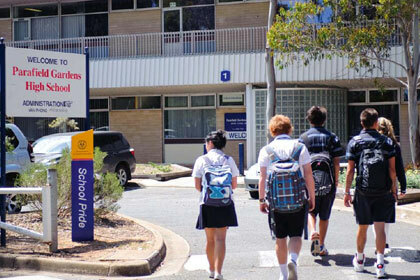 Our school is about 25 minutes from the Adelaide CBD and is close to a wide range of resources and attractive locations, including the Port River Tourist precinct and the beautiful Barker wetlands. To add to the learning environment our school uses the proximity of many features and resources. These include the University of South Australia (Mawson Lakes Campus: Maths and Science classes), the TAFE colleges, the Salisbury Council and the various industries of the district. This mix of industry and environment enables the school to offer a wide variety of learning experiences that open up exciting opportunities and career pathways for our students. An outstanding sport and extra-curricular program, including camps, inter school sports and athletics that develop our student?s social, emotional and physical talents. As a 'Trade School for the Future', we deliver a wide variety of pre university STEM programs and a wide range of accelerated vocational education pathways. "Our community is reassured that as an internationally accredited school we are benchmarked against world standards"